Following the terrorist attacks of September 11, 2001, Ranya Idliby, an American Muslim of Palestinian descent decided to write a children's picture book about the connections between Islam, Judaism and Christianity. Her children were asking a lot of questions about God and death and their religion, and she wanted to help them understand. 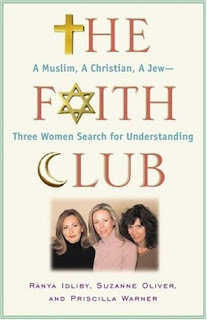 She asked two mothers ~ Suzanne Oliver, who is Christian, and Priscilla Warner, who is Jewish ~ to help her write this book. What came out of this collaboration was not a children's picture book, but rather an insightful, in-depth look at faith. The Faith Club is a very personal story of the struggles these woman faced as they tried to understand each other and their religions. I found it to be a very informative, thought-provoking book.It is a sort of exercise in comparative religion, but I like that it was done in such a personal way. Each woman talked about her faith, including beliefs, experiences and doubts. And they tackled the big issues that friends usually avoid discussing: things like Antisemitism, prejudice against Muslims and preconceptions about Christians. These discussions led to hurt feelings and disagreements at first, but later helped to build a foundation of trust and honesty that strengthened their friendships. I highly recommend this book to anyone who is interested in religion on any level. You don't have to be "religious" to enjoy it. I actually would not consider myself a religious person, but I truly enjoyed reading this book. It taught me a lot about religion, faith and friendship. This review was written based on a copy of The Faith Club that I borrowed from a friend. I've heard that this would make a good book club discussion. Thanks for the great review! Actually, we discussed it at my book club last January. It was a very interesting discussion. I definitely recommend it for book clubs. Glad you reviewed it, Julie! I have been itching to re-read it, and hope to again sometime this year!